Ta-dah! 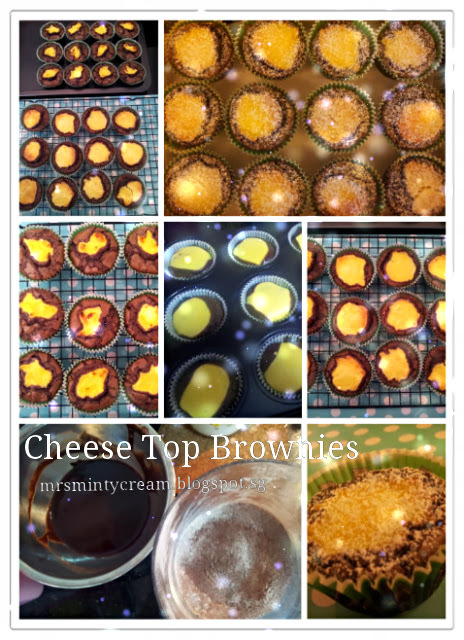 My version of Cheese Top Brownie! They look a little small in this paper liner, but trust me, they are just simply the most delicious small-bits devils! 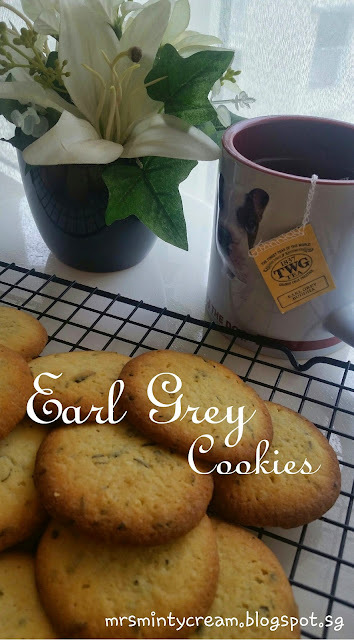 This has been my go-to recipe whenever I feel like pampering my family/friends with some sweet treats to thank them for everything and anything. So far, feedback on this little devils has been really positive! And I am getting more and more familar with this recipe, I can now better predict what my little devils' mood swings are. Haha! If you have read my last entry, you would be aware that I have received (and just completed) my very first order of these Cheese Top Brownie. The order came from my student and it was for a Children Day Party! Though it was just a small order of 25 of them, there were so much pride and happiness in me! I made a totally of 4 batches of 12 brownie each. Batch 1 was a test batch, which I wasn't very happy with because of the proportion of the brownie to the cheese topping. It was a little off. 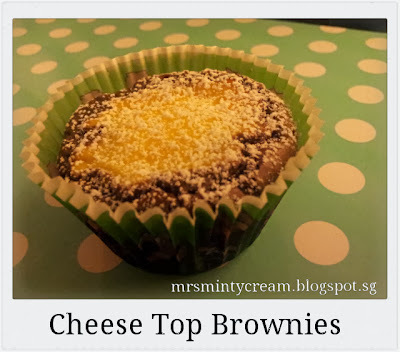 Too much brownie base, too little cheese. Batch 2 was much better (after changing to a slightly smaller muffin tray) and Batch 3 & 4 were excellent! With these delicious brownie, not only was I able to meet the order from my student, I also have some brownies reserved for my hubby, in-laws, friends as well as Ting & Lian (& Katie & Kelly) who I met up with on Sunday for a wonderful brunch + chit chatting session! I was so happy! Remember, sharing is happiness! Note: Icing the brownie after cooling them overnight really helps to ensure that the icing stays for a long period of time. And also, only fill paper liners to half so as to allow a good proportion between the batter and the cream cheese. This will also helps to make sure that the cream cheese are not 'burnt' and they will look really pretty! 1. Preheat oven to 175C and line muffin tin with paper liners. Set aside for later. 2. 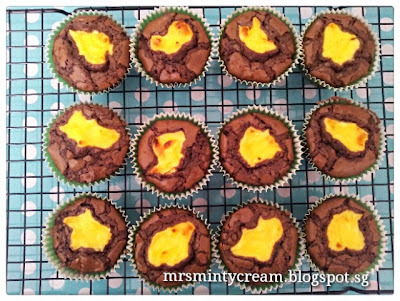 Melt chocolate chips & butter in microwave oven and stir together. 3. Sieve the dry ingredients (flour, cocoa powder, salt) and set aside. 4. In a mixing bowl, cream the sugar and egg together using a whisk for about 1 minute until the mixture is light and fluffy. 5. Add in the melted chocolate & butter mixture together with the vanilla extract and mix well to get a smooth mixture. 6. Using a whisk, add in the flour mixture in Step (3) (1/3 portion at a time) into the wet mixture in Step (5). Switch to a spatula to help with mixing. Make sure that the combined mixture is well-mixed, with no trace of flour. Be careful not to over mix the batter. 7. 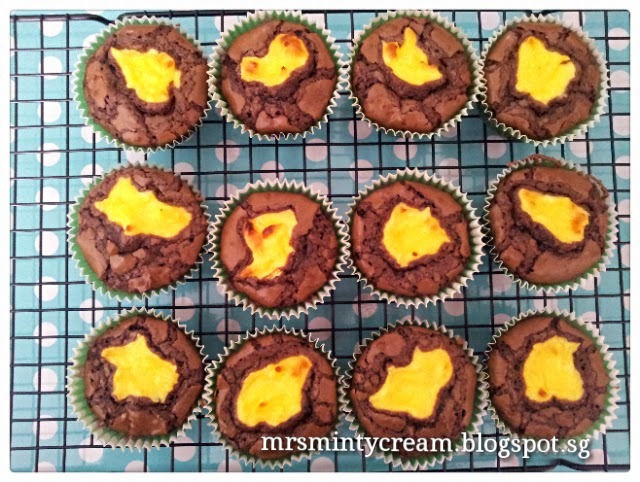 Using an ice-cream scoop, divide the batter evenly into 12 muffins cups. Each muffin cup should be filled up to 1/2 to 2/3 of the way. 8. Tap muffin tray on tabletop and shake it gently to ensure that the batter is level and evenly spread out. This also help to make sure that excess air is removed from the batter. 9. 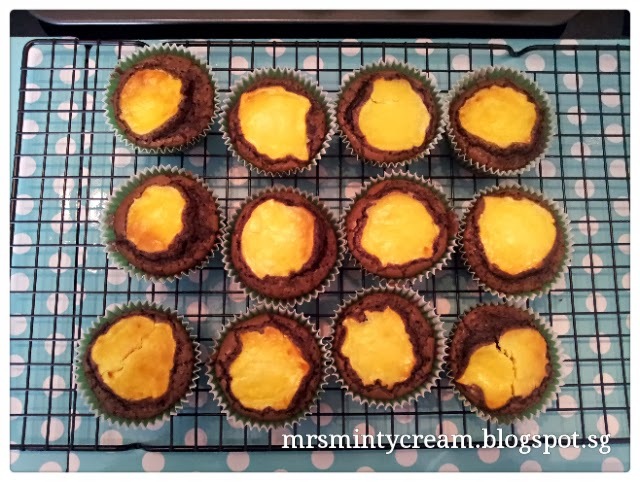 To make the cream cheese top, cream together cream cheese with egg yolk and sugar using an electric mixer. Make sure that everything is well-mixed. 10. 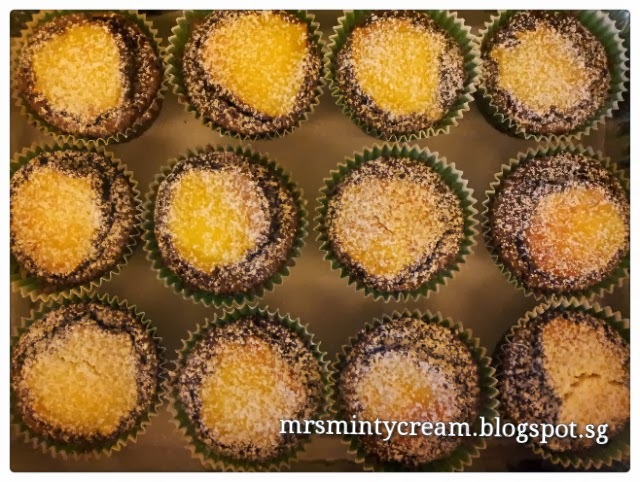 Add a teaspoon of cream cheese mixture to the top of each muffin cup. 11. Bake for 20 minutes (turn the muffin tray front-to-back after 10 minutes) and cool completely. If you would like to, you may add icing sugar to the top of the brownie after they are completely cooled (after at least 4 hours) before serving.